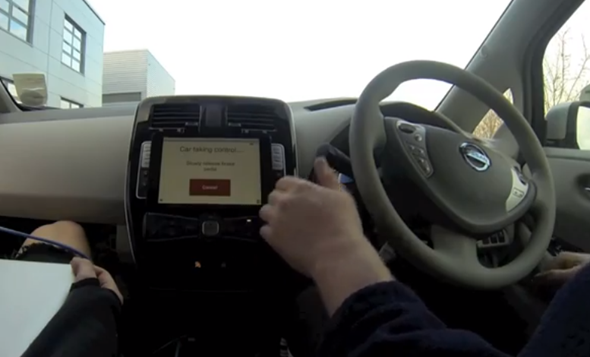 Oxford University’s Department of Engineering Science has developed a technology which allows a car to essentially drive itself – controlled by an Apple iPad. As demonstrated in a video of a Nissan Leaf electric car independently navigating through stretches of private roads, the robotic technology certainly takes the phrase "automatic car" to an entirely new dimension. It’s certainly an unrefined gem not quite ready for public consumption, but it looks very promising indeed, and is said to be aimed at allowing drivers to continue with a journey whilst taking short breaks from controlling the wheel. Although it is, in a sense, a navigation system, the low-cost technology does not use traditional GPS as per TomTom, Google Maps and such. Instead, it relies on a series of small cameras and lasers built into the car itself, which is all linked to a computer system in the boot of the car. The iPad is essentially the face of the operation, providing an easy-to-use interface from which the driver can activate the ‘auto drive’ aspect. If the brake is touched at any point, the auto drive element is abandoned, and normal driving is resumed. Oxford University’s Professor Paul Newman was keen to point out that this system is being designed as one which will offer some respite to tired drivers, alleviating the burden of school runs or drives home from being two of the more obvious ones. He doesn’t necessarily envisage a world with cars driving themselves all of the time, but instead, sees this "low cost, low footprint autonomy" as "what’s needed for everyday use." Some cars already park themselves, and with GPS / Sat Nav now as common a fixture in the car as a smartphone in the hand, this could be considered the natural next step. At present, the prototype system costs a cool £5,000 ($7,500), but Prof. Newman also adds that the eventual goal is to make it available for around £100 ($150). The Professor also reiterated that there’s lots more work to be done, but with so many pluses in terms of safety, efficiency, footprint, and of course aiding the driver, it’s certainly something we could see implemented in cars in years to come.